Don Burke takes us on a visit to the New Order Amish community at Ava, Illinois today. This small settlement, located in Jackson and Randolph counties in southern Illinois, is the state’s second-oldest (1991). As you’ll learn below, Don discovered a few things he didn’t expect. All yours, Don. Heading out with nothing more than an Amish-settlement-highlighted IL state highway map and the name of a bulk food store (which might suggest Amish connections) found on discoverbulk.com, I hit the road looking for the Amish in the area of Campbell Hill and Ava, IL. Just outside of Campbell Hill I noticed a small sign with the store’s name on it, and just down the side street I saw the bigger sign. 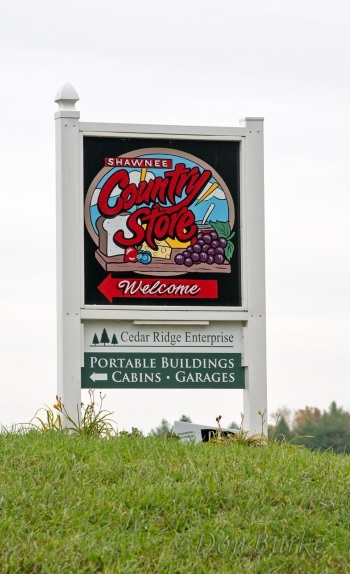 The sign struck me as a bit flashy for an Amish place…but that wouldn’t be the last of my surprises. I pulled into the parking lot and saw what seemed to be a pretty typical Amish-looking store. Inside I noticed a couple of Amish ladies working in the back, and bought a couple of things while I visited with the Amish lady at the register. 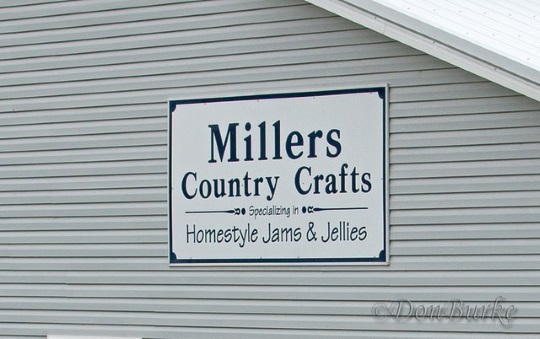 “Miller” – sounds like it could be Amish; “Country Crafts” – another plus; “Homestyle Jellies” – yep, I may be on to something here. But while the sign said “yes, we’re Amish,” other things about the place caused me to wonder…. The higher-wattage floodlights and the not-so-subtle AC unit – both strongly suggested that the Amish had left the building (and once again, I was wrong). 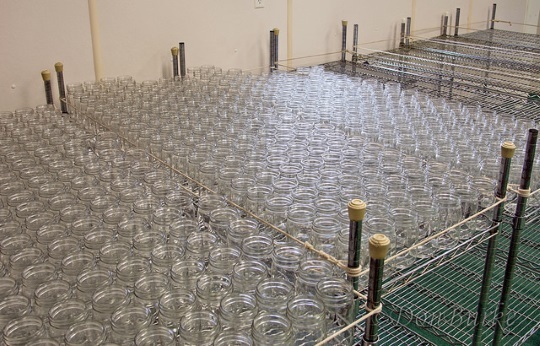 The Miller’s products are staples in many of the Amish stores for miles. He explained that this two-church-district community is New Order Amish. They hold to the same basic Bible beliefs as other Amish, but draw the lines in different places when it comes to the more cultural limitations. As such, they are on the “grid,” but would not use things like televisions and internet that could directly invite temptation. “And while we won’t pose for pictures,” he told me, they do not object to pictures that are taken as they go about their activities (my only disappointment was that I was not able to catch a picture of his sons while they were working in preparation for the day’s production). Here are pictures of the two homes on the Miller place. As you can see, they are not so different than English homes. 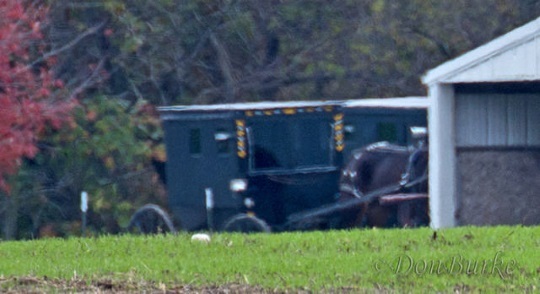 This made it virtually impossible to identify other Amish homes in this community. At least one of the church districts in this settlement has a permanent church building. 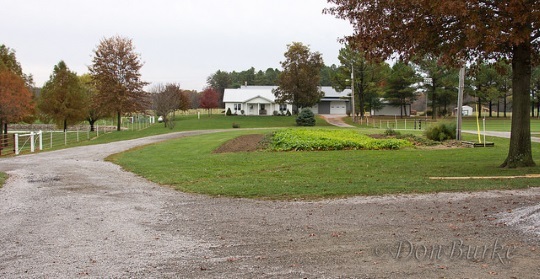 Here it is (I presume the building on the left) along with the Amish schoolhouse (I assume to be on the far right). The full album of this trip can be seen here. Thanks for sharing the pictures and narrative. Helps us learn more about the variations in Amish life in different settlements. The church building and school remind me of those in the Salem, Indiana (Rosebud area) New Order Amish settlement. They are not that different than from where they came from, be it from Guthrie Kentucky, Yanceyville or Union Grove North Carolina. Katie, i think they hail from Spencer, Wisconsin if I remember correctly. Nevins Father was born in Geauga county. His mother was born in Virginia.They moved to Union Grove. Not sure if parents moved to Illinois. Wilmas parents were from Arthur Illinois. How can someone not from the area of Ava buy some of the Millers products? First, thanks Erik for highlighting my little adventure and the pictures that went with it on your website. It’s always an honor. Second, George, if you are asking if anyone (even not from the area) can simply walk in a buy from the Millers, the answer is yes. (That is what I did.) They do not have much produce on display (less than 6’x6′ of shelving, as I recall), but they do have stuff for sale there. If you’re talking about buying the Miller products from other place, I don’t know how far their distribution is, but I have seen their products in bulk food / variety stores elsewhere. Their phone number is 618.426.3108, and I’m sure you could call and ask. Miller's Honey, Jam and Jelly is for sale at Rural King. 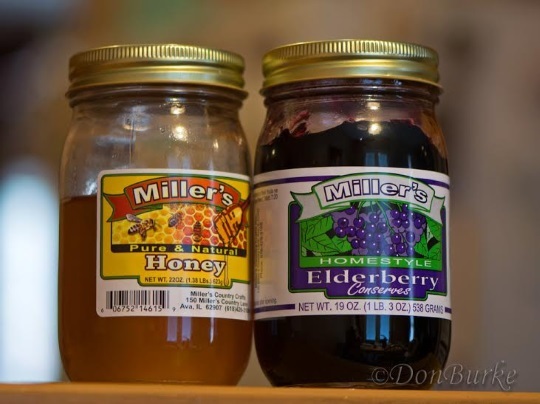 First: Thank you Don Burke for the pictures and story on Millers Country Crafts, I had been curious about who makes such a wide selection products locally. Today, 14 APR 18, I saw Miller’s Honey, Jam and Jelly for sale at Rural King, at least the one in Marion IL. Several years ago I purchased their Elderberry Jelly at The Chocolate Factory in Dixon Springs IL. Liked the flavor so much I started growing Elderberries at home. My granddaughter, Ava (now 3 1/2) may someday be pleased to know there’s a town in her home state with the same name as hers. I hope to visit it someday. I am pretty sure I’ve seen Miller products somewhere—perhaps in a catalog that serves the Amish? Or even in a local store that carries many items from many places (they do carry Amish noodles & cheese). I’ll have to look into it further. How interesting about being on the grid, yet not using the internet or TV…sure seems as if it would be very tempting (how do their youngie fare during Rumspringa?). Thank you, Don, for your photos & comments. I’ll be interested in learning how this community fares in coming years. Alice Mary you may be thinking of Mrs. Miller’s out of Fredericksburg, Ohio. They’re actually not an Amish-owned company but do sell noodles and other food products and have a pretty wide distribution from what I’ve seen. Yes, Erik, I’ve seen Mrs. Miller’s Noodles in my local “specialty” store, as well as Das Essenhaus noodles (the hotel & restaurant & shops in Shipshewana, IN), though I don’t know if their noodles are Amish-made. I know some Amish work in the restaurant (my waitress was Amish) but I’m clueless as to who makes the noodles. I was referring to the Miller “conserves” (preserves, I assume). The jar design looks familiar, but I can’t place where I may have seen them. I was surprised at how “commercial” the label looked. Now I can’t get it out of my mind! 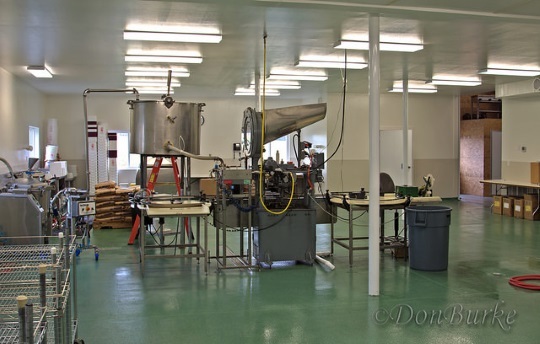 Now I have a craving for a warm slice of fresh bread with a slathering of Amish preserves…sigh! Thanks for the pictures and narrative, Don. It is interesting to see a New Order Amish community! Very interesting. 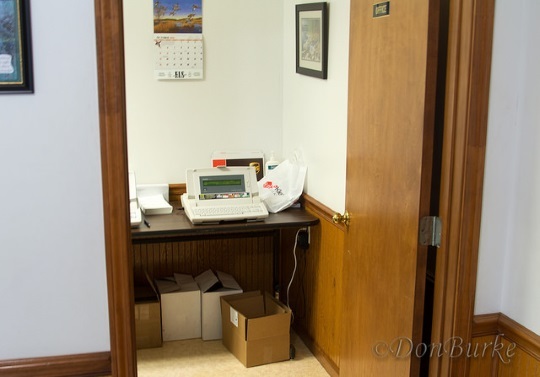 The electric word processor was a definite indicator that they are holding the line on technology. A regular business would just get a laptop computer. In some ways I could see it being a lot harder to adhere to the rules of a New Order community than a more conservative one. It must be hard and frustrating to use a word processor, for instance, but not have ready internet access. Especially when a full powered laptop could so readily take its place. And with less apparent cultural separation from the mainstream society, it must be easy to get caught up in the ways of the outside community. So my hat goes off to the New Order Amish who apparently are able to incorporate more technology and still keep their separate traditions and identity. Ed that’s really an interesting observation. It might have something to do with the generally lower New Order youth retention. I found their products in Rural King in Waterloo, Illinois. I bought their Jalapeno Jelly and Hot Pepper Jelly for my folks in California. They especially love the Jalapeno Jelly and want more!! the name is Miller’s conserves I purchased at save a lot grocery in Vincennes Indiana ..first time i’ve had elderberry …love it! !